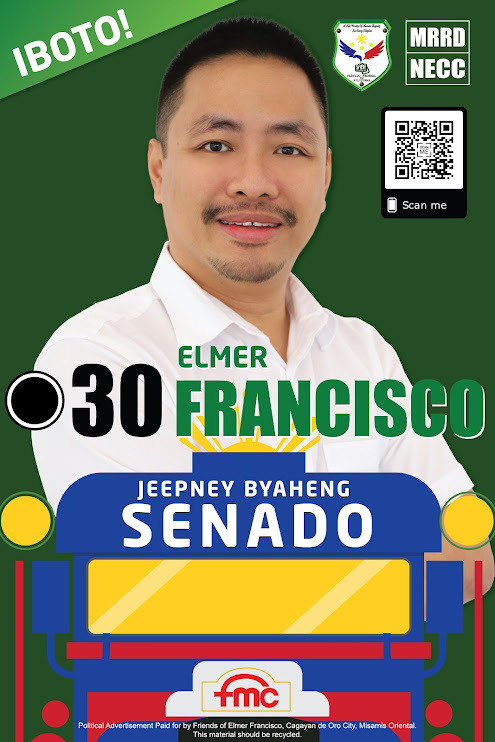 CAGAYAN DE ORO City mayoralty bet Elmer Francisco cried foul over what he perceived as discrimination when he and four other candidates were excluded in a candidates’ forum held at Xavier University gymnasium on Tuesday. Francisco, a businessman, on his Facebook page, posted the letter from Xavier University-Governance and Leadership Institute that arrived in his office only on Tuesday, the day of the forum. It informed him that he was no longer included in the forum as it turned into a face-off between reelectionist Mayor Vicente Emano and his challenger Misamis Oriental Governor Oscar Moreno. “Xavier University (Ateneo de Cagayan), by virtue of their attached letter, is unfairly limiting the choices of the people of Cagayan de Oro City to only two candidates out of the seven eligible candidates. “Where is the democracy?” Francisco asked. Francisco’s statement lambasted the XU-GLI over what he called as an unfair treatment. “Is this the kind of democracy that the Research and Social Outreach vice-president of the prestigious Xavier University (Ateneo de Cagayan) teach? Maybe she has a different definition of democracy? Maybe the higher management of the prestigious Xavier University did not know about the actions of their employees?” Francisco asked rhetorically. Francisco lamented that in the previous forum from XU, they were able to accommodate 15 candidates for councilors and vice-mayors. Dr. Dixon Yasay, Director of Xavier University-Governance and Leadership Institute (XU-GLI) who organized the forum, said that the first consideration was time constraint, “much as we would like to accommodate all candidates, we have a limited time,” Yasay said. “Whatever the reason is, I do not know but I will not accept time constraints as an answer,” Francisco countered Yasay’s explanation. 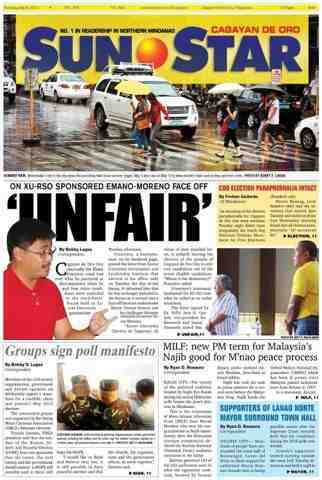 The letter further stated that the forum was intended to hear out the top contenders (Emano and Moreno) on their performance and alternative plans based on the top five identified and expressed needs of the electorate based on a survey conducted by the XU-Kinaadman Research Center (XU-KRC). Yasay said that the second consideration why only Emano and Moreno were invited was due to the result of the survey that XU-KRC commissioned. “Only the two (Emano and Moreno) stood out, the rest of the candidates have less than one percent chances of winning,” Yasay said on the phone. Francisco’s Facebook (FB) post generated comments, and called the move of XU an “elitist” one. Bacal added that he is not for Francisco but is one in condemning the act of discrimination. “XU is clearly supporting traditional politicians,” Bacal said. The post has generated hundreds of likes and was shared 77 times.